Yes, there’s nothing more satisfying than remembering those wonderful days when you were on the verge of ripping out your eyebrows, or putting your laptop in a headlock because you were struggling with the construction of a particular 3D model, or couldn’t get the interior lighting just right. Or sometimes I just laughed it off. And usually in a fit of blind rage. I’ll admit that it sounds quite dramatic to sacrifice your perfectly primped eyebrows just because the fur on the cushion that you’re trying to render isn’t as fluffy and randomly dispersed as you would like but trust me, to a 3D Visualiser this stuff is important. Actually, it’s more than important. For a 3D Visualiser, achieving a convincing photo-real scene is all consuming. So when you finally reach the stage where all the reflections, textures, finishes, lighting, colours and individually modeled components are EXACTLY as you intended. And you’re content with all of the 357.9 test renders that you’ve conducted AND you’ve commenced FINAL renders, a pat on the back and a well deserved glass of vino is in order. So, back to the Hall of Fame. I’ve decided to round up my top 5 3D visuals from I embarked on this journey of self-loathing discovery. This little exercise is actually quite cathartic; looking back at my previous work is quite similar to the involuntary associations we can sometimes experience when we hear a specific song. The melody and/or lyrics of a song can sometimes transport you back to the past; of times in your life when you were young and carefree, or to a time when some a$$hole ripped out your heart and stomped all over it (that has absolutely no reference to me…no sir-ee) or to a cherished event in your life that you remember fondly. Peeking at previous 3D visuals won’t remind me of good-for-nothing losers or a carefree childhood, you understand but I will be reminded of proud achievements, major breakthroughs and a few Diva moments when I felt nothing but frustration and despair. This 3D visual is most definitely NOT my best. It’s extremely lacking in skill, knowledge and creative flair but it was my very first attempt at rendering and therefore holds a special place in my heart. We never forget our ‘first’, right? I can still remember my whoops and cheers that evening (2 years ago) at FINALLY producing a 3D photo-realistic render. It took many hours of sheer determination to get to that stage and unbeknown to me, I hadn’t even scratched the surface. This 3D visual has earned its place in my top 5 because it’s reflective of soooooo much technical ability and it looks damn good! By the time I produced this 3D visual I had already worked out how to incorporate background scenes into a render (this took me a loooooog time to master) and I had successfully conveyed a velvet texture. Doesn’t sound overly challenging but in actual fact trying to replicate velvet is pretty tricky. The overall composition of the scene combined with the impressive architectural structure makes this a 3D visual to be proud of. Ok, so this is part of the same project as number 4 but this particular 3D visual deserves a mention because of the attention to detail. And by ‘detail’ I mean the water in the vase. When your skill, experience and knowledge reaches a certain level (and I’m only too aware that I STILL have lots to learn) you find yourself focusing on the finer details. When I chose this angle I decided to fine-tune my abilities where water was concerned. And I’m not lying when I say that I probably spent an entire weekend playing around with various techniques and conducting countless test renders to achieve the above look. I also examined water in a vase. Yes, I actually poured water into a vase to see exactly how objects in the background appeared etc. Hence, my inspiration for the ‘Study your Subject’ blog post. As I’ve become more confident in my ability. I’ve taken more creative risks and this image not only looks incredibly ‘real’ but also visually captivating. It’s because of its photographic properties that it has sailed into 2nd place. It’s also reflective of my increased skill where Photoshop is concerned – another steep and painful learning curve! I’m especially fond of the texture of the bird in this scene and the realism of the cushion. At this stage in my development I learned that it isn’t necessary to try and squeeze the whole design scheme into the image. Sometimes glimpses of design elements at intriguing angles is more than enough. The number 1 spot HAD to be given to this little beauty and for a number of reasons. This single image epitimises my ‘breakthrough’ stage. All of the practicing, the late nights, the incessant research and determination to continually improve and refine my skills and knowledge can be witnessed in this 3D visual. I’m still extremely proud of this render and feel a tremendous sense of achievement every single time I look at it. Why? Because it takes a lot of skill, confidence and courage to render a 3D model THAT closely. Every little detail is open to scrutiny/criticism. And when you’ve exposed yourself in this way, you’re also exposing your raw skill and talent. I spent a ridiculous amount of time trying to perfect the transparency and reflections of the bulb. I mean, a REALLY long time. I experienced a whole heap of emotions as I conducted test render, after yet another test render in my quest to achieve an accurate replication of the bulb, brass texture and filament. But the perseverance paid off, in more ways than one. Maxwell Render (the rendering software that I use) published this very render on their website and asked me to write a ‘Making of’ case-study. As a 3D Visualiser, there is no greater honour. I was delighted, ecstatic and immensely proud. And let’s not forget that this 3D visual (and 5 others) were eventually showcased at Grand Designs Live in London. I finally felt that I was becoming a ‘proper’ and credible 3D ‘artist’. Perhaps you can now see why this 3D visual is my number 1! Friend: Could look at this light bulb all day, seriously. Me: She’s a beauty. Completely fictional but a beauty nonetheless. Friend: It’s what the eye and the brain make of it…to me, she’s very much real. Me: And she sits so proudly, doesn’t she?! I’m almost convinced that we could probably sit and observe this bulb and pass casual comment on it all night! Friend: Absolutely, such as “Look at the right hand edge of the filament”……..half an hour later….”Look at the left hand side of the filament” etc., etc. Me: That’s exactly what I was imagining! And maybe, after a cuppa and while munching on a biscuit, you could reflect a little more with ‘look at how the reflection of the filament casts little flame-like shapes though’. Friend: With a second biscuit you could say “Look at the exquisite teardrop at the base”. Me: Absolutely. Then you could reply with ‘yea, that teardrop is so emotive’ as you nibble at the same time, with the odd crumb falling into your lap. Friend: ….and as I brush them away, I could say “Look, that mirrors the gentle movement in the beautifully crafted flex…”. Me: I’m seriously laughing out loud!! I think we’re the only people who would appreciate this type of discussion! I could reply with, ‘yea, the flex’ and slowly nod my head in agreement. Friend: …whilst reaching for a packet of crackers. Nope, if something moves you, you have to talk about it. Me: As I eat 6 crackers in one go…I could then comment (with obvious difficulty) on the interesting and subtle tarnished texture of the brass, which provides an effective contrast to the purity of the glass. Friend: Whilst delicately spraying the room with cracker mush, but I would be so rapt that I wouldn’t notice because I would be agreeing and saying “Yes, the texture of the tarnished brass is so strong beside the beautiful and delicate glass…..pure serendipity. Me: Resembling the Cookie Monster, with cracker dust all down my front, that you are politely trying to ignore, I could then observe the soft reflections of daylight on the glass. Friend: ….and in turn…I could perhaps comment on the gentle shimmer created on the wall by said beautiful bulb. Friend: Omg… I have looked at it again, that’s it for the day. 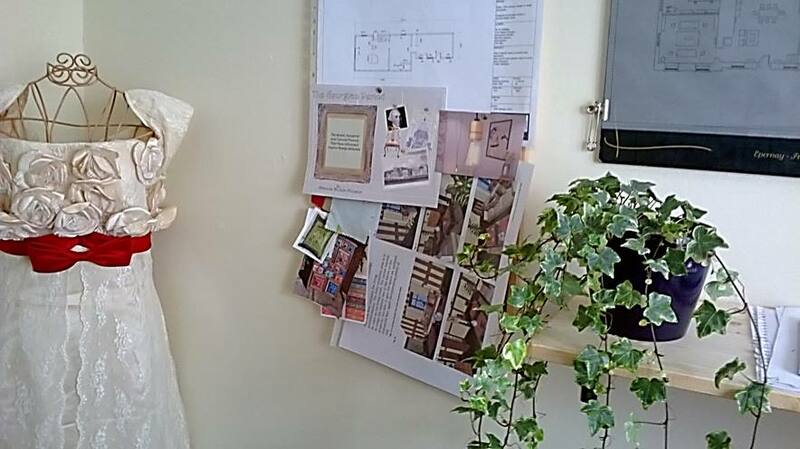 Then my dear friend sent me this photo of her noticeboard. Having a peer acknowledge and appreciate your work on that level? It doesn’t get much better than that!